Flowswitch is a flowmeter that monitors the volume flow of liquids. 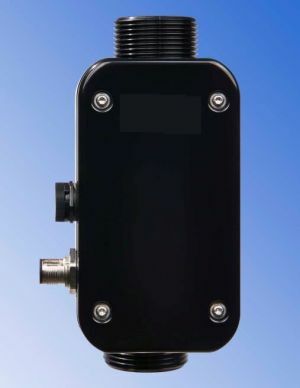 Based on ultrasonic technology, Flowswitch can measure non-conductive and conductive non-conductive liquids. Flowswitch has no moving components and is therefore wear-free. The tube cross-section is low in dead space over the entire channel geometry. All wetted parts are made of PPSU. Flowswitch can be used from DI water to alkaline, toxic and / or aggressive media. Flowswitch is suitable for operation with piston diaphragm and peristaltic pumps. From exceeding the nominal size dependent low flow rate, the digital output 1 is switched to 24V (factory setting). This will visually display the function of the pump. The digital output 2 switches 24V at pipe recognition. For an individual adjustment of the flow limit value the use of the FlowCon 200i is necessary. This display and programming unit is not part of the delivery of the Flowswitch.